Traditional room based video conferencing solutions is moving to higher and higher video quality with high-definition end points. 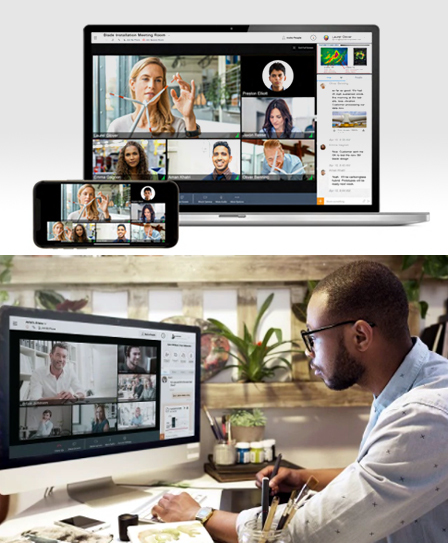 New unified collaboration solutions from the major application and telephony vendors promise to bring conferencing to the desktop and mobile users. Both trends are driving the need for new levels of scalability and device support. As a result, enterprises require a solution that support and protect their current investment in standards-based conferencing solutions, while giving them the flexibility to adopt these emerging conferencing solutions. To meet the demands of today’s businesses, we provide real-time video solutions for HD video conferencing and collaboration, which include clients for desktops and mobile devices, as well as traditional meeting room systems. ANY DEVICE (Desktops, mobiles, phones or personal/ group mobile systems). DESKTOP VIDEO: Expand the reach of a conference room deployment to remote and desktop users. Connect from anywhere with PC and Mobile based Applications. OFFICE AND CONFERENCE ROOM VIDEO: Our video conferencing solutions enable high productivity, multi-location group meetings with HD voice and video conferencing, and content sharing. BYOD VIDEO: Mobile applications offered by us extend video collaboration to mobile devices, smart phones and tablets. OPERANT offers a telepresence mobile application that allows users to connect to any standards based telepresence system from almost anywhere. The Mobile application is available for the Apple iPad, iPhone and iPod touch and delivers full video, audio and data collaboration. The Mobile application is the perfect solution for regular telepresence users, enabling them to extend video communication beyond the workspace to their hand held technology and allows for telepresence system control.